Signed up with OS X Yosemite Beta program months prior to release and seeing this email 45 minutes ago, to my surprise made me jump out of my couch. It's sad to say that the OS X Yosemite Beta program has ended however it's a fresh new start for the consumers' to enjoy a robust great system now ready for download. 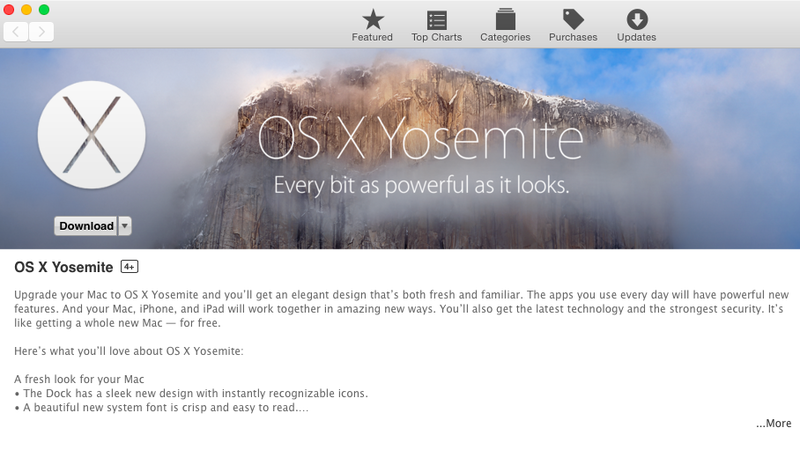 Please install the release version of OS X Yosemite. 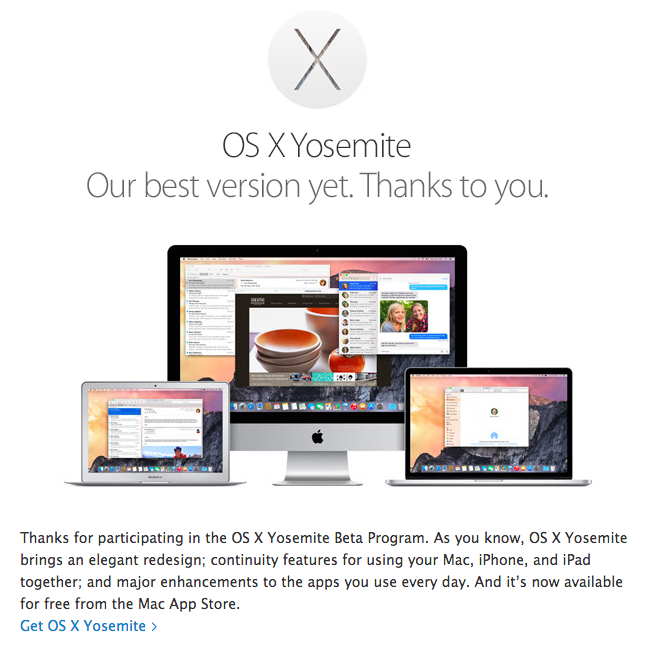 As a member of the OS X Beta Program, you will continue to be offered beta versions of OS X software updates on any Mac that you installed the beta on. However, if you prefer to stop receiving beta updates, you can download the final release. What I am personally looking after in this release is the beauty of its simplicity - clean user interface and design. It's sleek, clean and just light - simply you go black or you go white opaque UI. Second is the Continuity feature, as I am writing this blog, I have been sending not just iMessages but text messages to friends and contacts. You can also receive calls just right from your desktop - well, I am using a Macbook Air 13" and not certain on non Apple devices if this is the case too. 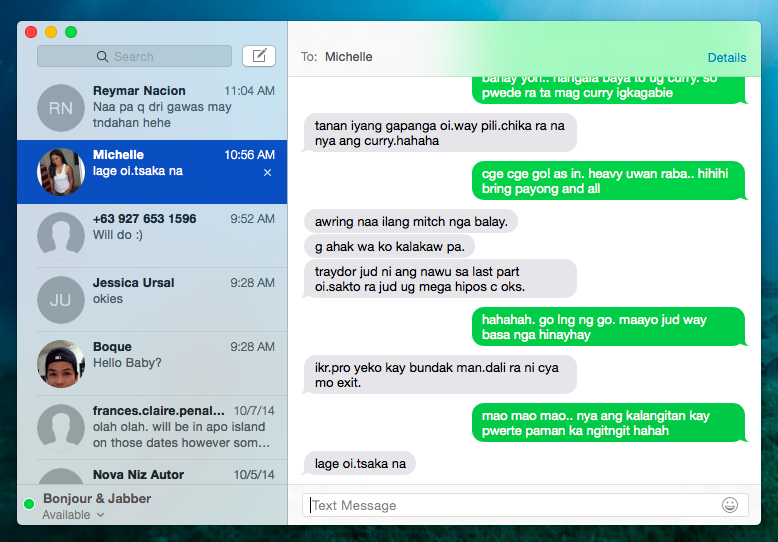 Me and a friend, Michelle sending text messages just right on my desktop. My iPhone 5 can be anywhere - take advantage of this Continuity feature, call and text using your OS X device. Well, before I can lay my hands on the final release of OS X Yosemite, we here in the Philippines, still need to struggle to download the 5.16 GB operating system. We currently have that 5Mbps connection from Globe and got roughly 4 hours to download. Yes, patience. Looking back on it's past OS X Yosemite Beta releases, here were the issues that I encountered. Now getting pump up to install this final release of OS X Yosemite. Have you downloaded it already?